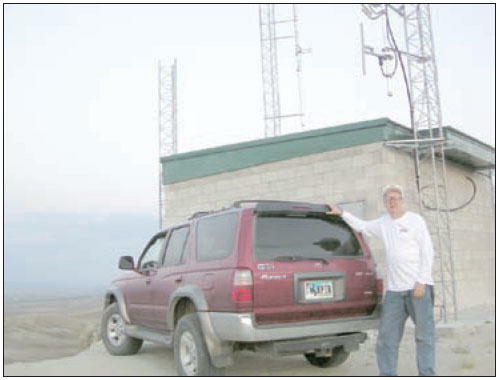 KPIN’s Bob Rule stands in front of the building where his new antennae was installed this past summer on Mount Airy. Pinedale goes in for another Wrangler touchdown. Emergency personnel and law enforcement ask all citizens to evacuate their homes. Be sure to bundle up because the forecast calls for dangerously cold snowstorm in the Sublette County area. What do all of these comments have in common? A voice. 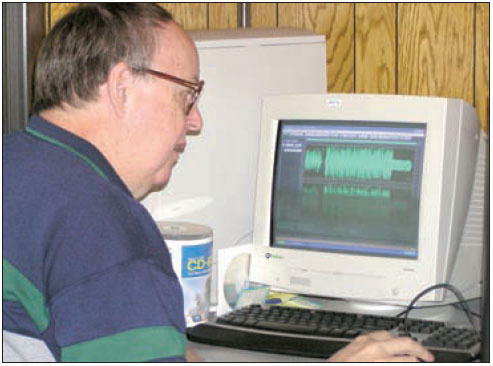 The citizens of Sublette County are able to listen to Wranglers athletic events, keep track of weather conditions and so much more thanks to Bob Rule, owner of KPIN and his work at the radio station in Pinedale. Rule and his radio station celebrated 10 years of community service on Sunday. The beginning of a radio station in Pinedale came about in an unusual way. Rule had no idea that his casual question would result in him building a radio station in Pinedale, but it did. It didn’t take long for the phone to start ringing. Upon returning to Cheyenne following the convention, Rule received numerous phone calls from Sublette County people, encouraging him to come and build a radio station in Pinedale. Thanks to people volunteering and helping Rule out, KPIN was built. The initial location of both the studio and the transmitter of KPIN was in the Pine Creek Motel. Rule built a 50-foot radio tower at the motel in order to transmit his programming. Rule works from his home studio on an ad for the radio. Shortly after signing the radio station on the air, Rule rented an office in the Knotty Pine Plaza, which is now known as The Summit Building. 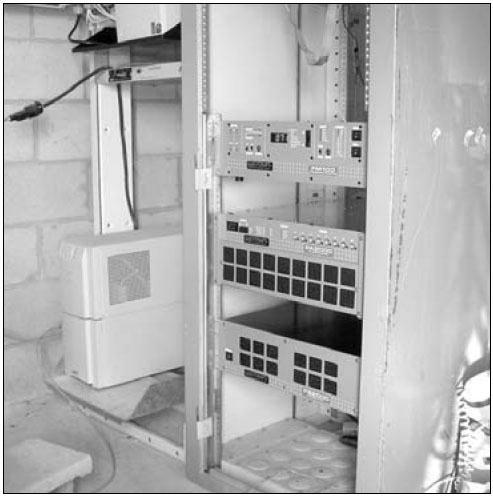 The transmitter remained behind at the Pine Creek Motel and was moved to the utility room. The studio was connected to the transmitter at the motel with direct leased copper telephone lines from the local telephone company. KPIN has come along way since signing-on 10 years ago, but it wasn’t easy. Rule received his college degree (bachelor’s of science in electrical engineering) from the University of Wyoming and had spent most of his life working in radio and television broadcasting, mostly on the technical end. The transmitter Rule used was only 250 watts so the power bill wasn’t much of a problem, but staffing proved to be a challenge. Pictured is the new equipment Rule installed this summer. Rule used a combination of volunteer help and part-time employees to keep the radio station running and returned home to Cheyenne. In 2002, it became obvious to Rule that he had personnel problems, so he drove to Pinedale to assess the situation. He concluded he needed to hire a new manager, but that didn’t last long. Unfortunately for Rule, that employee didn’t work out. Meanwhile, back home in Cheyenne, Rule’s wife Karen kept wondering when her husband would find and hire a manager and come home. “Sure, I came home on some weekends, and she and our son David came to Pinedale on some weekends, but most of the time, we were in separate cities...something that neither of us liked very much,” he said. Rule knew something had to be done. He couldn’t stay away from his family, so he sold his radio station in Cheyenne (KRRR) as well as his radio station in Laramie (KHAT), and after two years of running KPIN, the family moved to Pinedale. “We still had a pager company in Cheyenne, but my long-time office manager Lynnette Lyttle, was quite capable of running that business without me,” Rule said. Rule has many fond memories over the past 10 years, including the first guest to do an interviewon the radio station in Pinedale, Mayor Rose Skinner. “I think Rose was quite surprised to be interviewed in an unheated motel room in the dead of winter, with all of the equipment spread out over an un made motel bed,” he said. One of Rule’s first major projects when he came to Pinedale in 2002 was relocating the transmitter from the Pine Creek Motel to Mount Airy. KPIN’s next big move was this past summer when Rule increased the station’s power to 4,000 watts. “This greatly improved the reception in Big Piney and Marbleton, and many other outlying areas, too,” he said. Did Rule ever hire that full-time manager? No. Even though cleaning isn’t his forte, Rule is looking ahead while technology continues to improve and the station continues to progress. Rule recently had Wyoming.com set up a Virtual Private Network system so he couldaccess computer files at KPIN from his home computer. “That makes it much nicer when I can do much of this late-night work at home now,” he said. Rule has devoted a lot his time making KPIN what it is today. In fact, who knows if Pinedale would even have a radio station? Thanks to his commitment, citizens of Sublette County are able to listen to high school athletics, prepare for bad weather, respond to emergencies and so much more. Other than the long hours, Rule loves what he does.